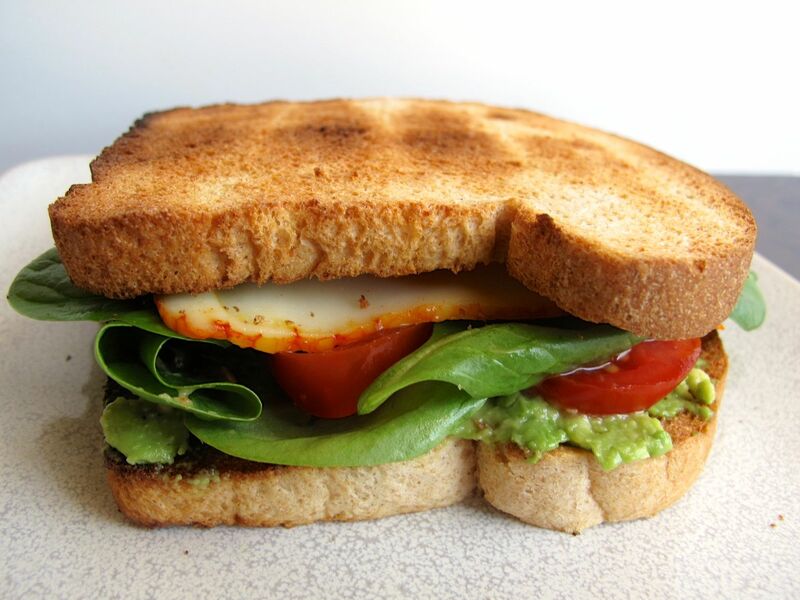 I love sandwiches and toast—they are the perfect compact foods. Since renouncing store bought bread because I was learning to bake for myself, I haven’t been able to eat sandwiches or toast at all; I just wasn’t good at making tall, airy loaves of sandwich bread. Back when I used to make baguettes quite often, I would slice them thinly and have tiny turkey or peanut butter & jelly sandwiches, but baguette bread is a sad replacement for the whole wheat loaves that would call out to me whenever I walked passed the bread aisle in a grocery store. In the roughly 3.5 years since starting to bake bread for myself, I’ve bought whole wheat sandwich bread only once. In my defense, I was sick and I wanted to make grilled cheese to go with canned tomato soup (this was before Allison created a tomato soup from scratch that I will freely admit is leagues better than any canned stuff). Every time I would attempt to make whole wheat bread, it would turn out looking and feeling like a brick. 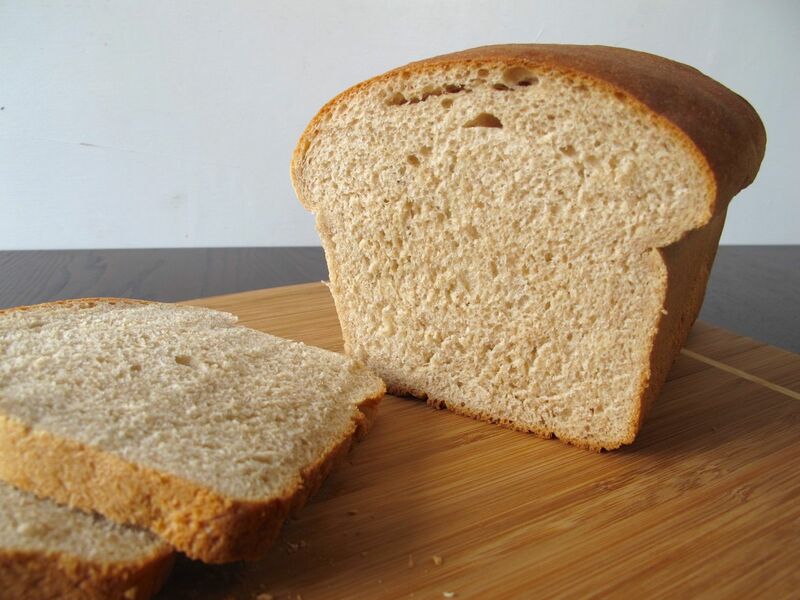 I tried so many recipes, so many times, starting with Peter Reinhart’s recipe for whole wheat bread. After my first failed attempt, I went online and found so many other people who’d used the same recipe with success. Only my recipe would fall flat and become dense. When I would slice into it, it would either crumble and fall apart or resemble a combination of sliced spam and cardboard. I tried Deborah Madison’s recipe, the many recipes provided on King Arthur Flour’s website, and the recipes in KAF Baker’s Companion book, and they all fell flat. Many of the recipes called for honey or molasses. I did not like how sickly sweet 1/4 cup honey made my loaf of sandwich bread, and no matter how little molasses I used, it still tasted very strong. King Arthur Flour recommends adding in “whole grain bread improver,” but I’ve never used it before and anything with “improver” in the name makes me feel like I’m cheating a bit. 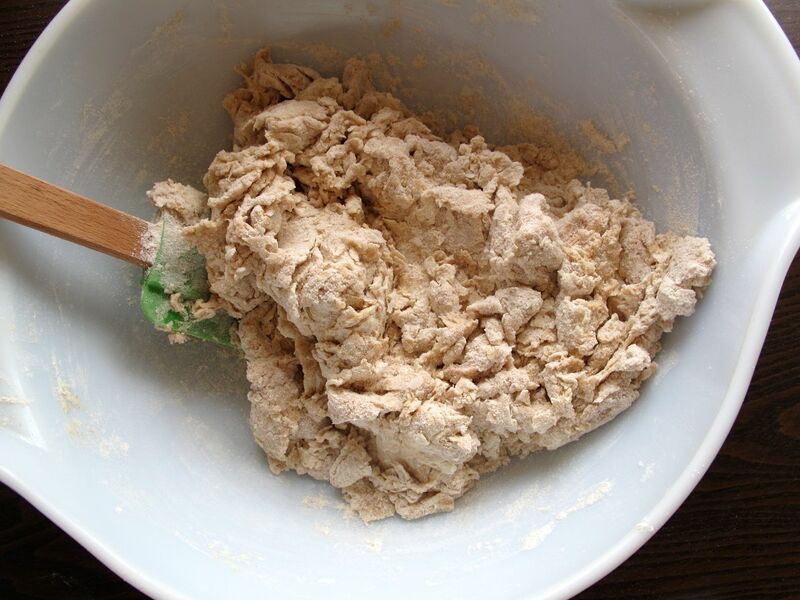 The KAF cookbook also states that mixing, kneading, and shaping whole wheat dough by hand will result in a dense brick; only using a standing mixer will yield a light loaf. Our Cuisinart food processor has a dough blade so I decided to try that. The loaves were airy and nice, but the sliced bread would crumble and fall apart when handling it. I was so very close to finding a recipe that worked, but the crumbly slices couldn’t hold up to any sandwich fillings, even when I toasted the bread. I had all but given up hope for a decent homemade loaf of whole wheat bread. Why not just make white bread, you ask? Well, white bread bores me. 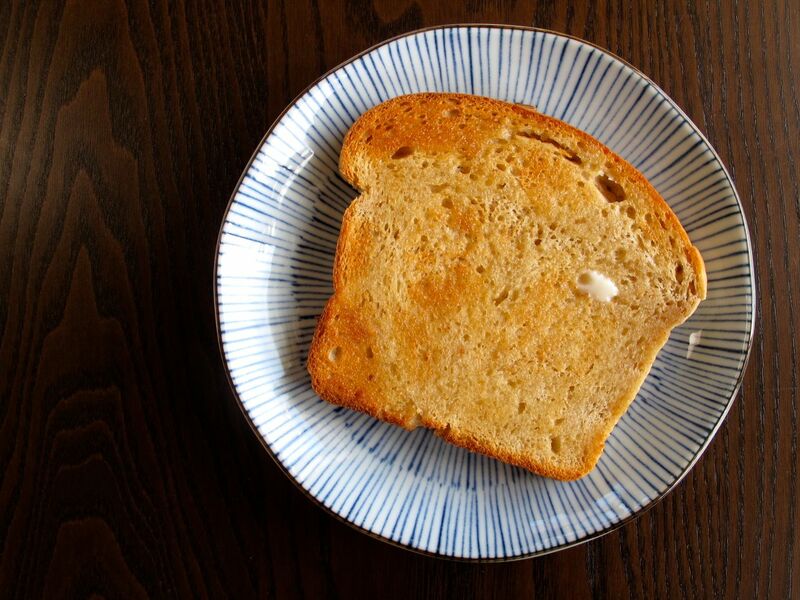 I remember eating Wonder Bread as a kid and it was okay, but as I grew older only wheat bread held any real interest for me for sandwiches and toast. I figured it would be pretty easy to make white sandwich bread but I had no interest in making white bread if it wasn’t a sourdough boule, baguettes, ciabatta, or something interesting. I had an idea a while back and Allison reminded me of it recently: I should buy some vital wheat gluten. Back when I first started baking bread, I had a bread machine. I gave that bread machine away to a friend (after Allison gave me a baguette pan for our first Christmas together and I started handling dough by hand). 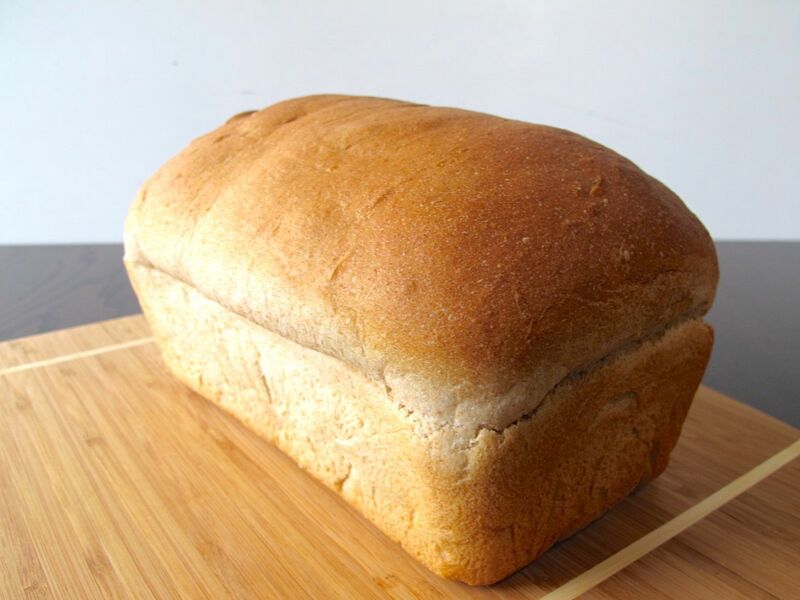 Before I gave it away, I remember the machine producing tall, fluffy loaves of whatever bread I fancied. I made dark brown Bohemian Black Bread, Whole Wheat Challah, and Whole Wheat Sandwich bread. Unfortunately, bread machines yield very tall, very square loaves of bread, unsuitable for sandwich slicing (I was either too lazy or too intimidated to take the dough out of the machine for shaping). 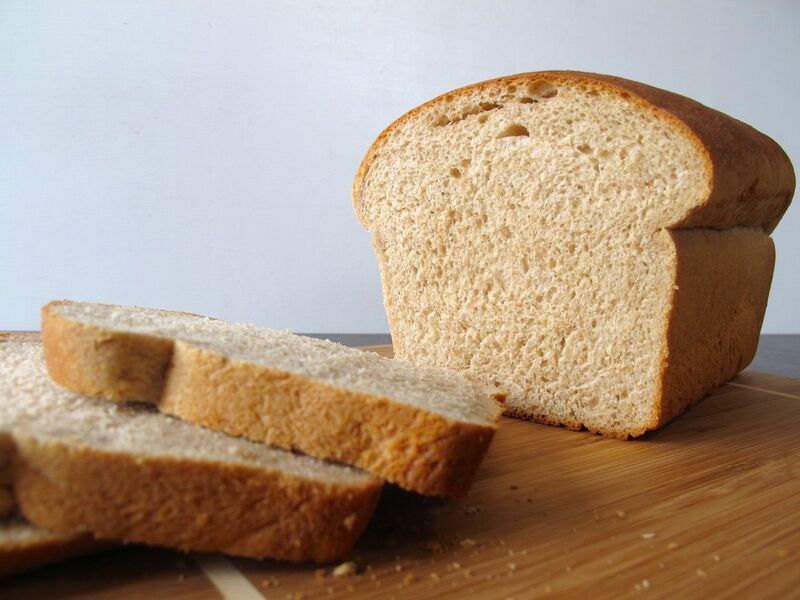 I remember using white and wheat flours, vital wheat gluten, even potato flakes in my bread machine, so Allison and I started thinking that I needed to be a bit more creative with my ingredients. I had some brain storming to do. I found a recipe in my King Arthur Flour Baker’s Companion for white sandwich bread (yawn), which I decided I wanted to use for my base. Instead of using three cups of all-purpose flour, I decided to use 1.5 cups bread flour and 1.5 cups Bob’s Red Mill whole wheat flour, a touch extra yeast, a bit of sugar instead of honey or molasses, and some potato flakes in place of the powdered milk (I could not justify spending $10 on a little box at my store if I wasn’t sure it would work). I made sure to use our food processor with the dough blade. After the dough had processed, I did not shape and let it rise before putting it in the baking pan for a second rise; in my experience, the dough always falls on the second rise. I took the dough out of the food processor and immediately dumped it into the baking pan for only one rise. The modifications I made created a towering, fluffy loaf of bread that was perfect for PB&J or grilled cheese. The only problem I still had was making sure I kept a close eye on the rising—I had a bad habit of letting it rise too much and finding the dough spilling over the sides of the pan while baking. This is 50/50 white and wheat flour bread, not 100% whole wheat bread; I’m still working on that. But I am very happy with this recipe. 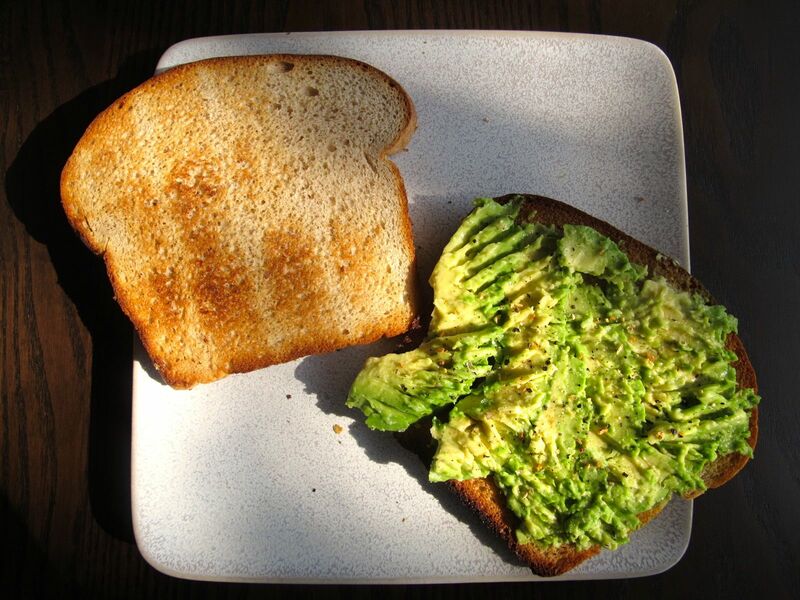 I’ve made it quite a few times now and Allison and I are thrilled that we can now have sandwiches and toast again. Active time: 20 minutes; Total time: 2 hours. 1. In a small bowl, add the instant yeast to the lukewarm water, and let sit for 5 minutes until it’s foamy. 2. In a large bowl, combine the flours, potato flakes, vital wheat gluten, salt, sugar, and chopped butter. With a pastry blender, blend the butter into the dry mixture until butter is well mixed and pieces are as small as a pea. 3. 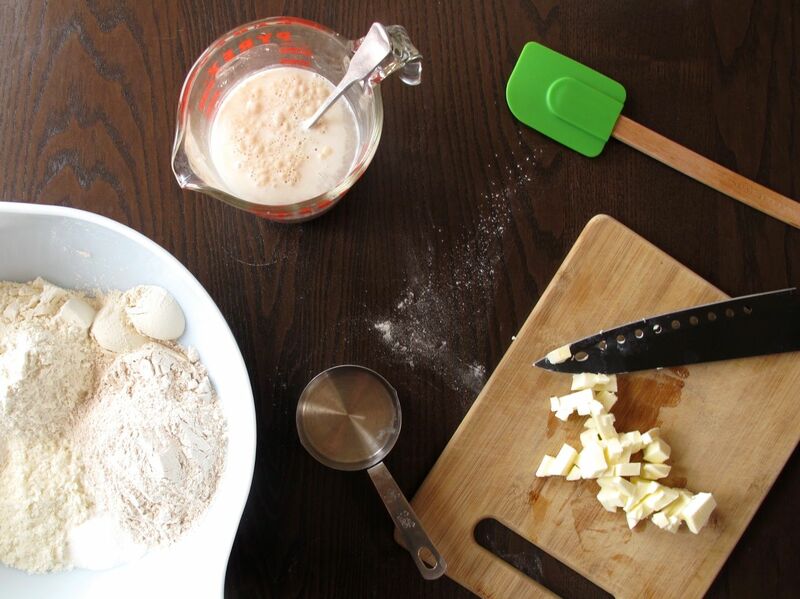 Add foamy water to dry ingredients and mix with a spatula or your hands until just combined. Transfer the dough to the food processor (with a dough blade), and pulse on the dough function until all the ingredients are well mixed. 4. 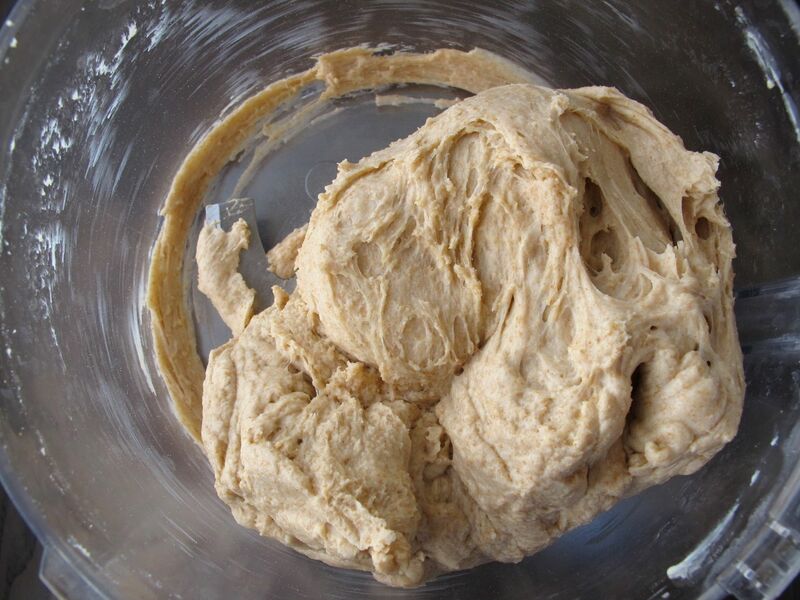 Once dough is fully processed it can sit for a minute or two while you use the 1 Tbsp. reserved butter to grease the baking pan. Pull the dough out of the food processor and add it to the pan. At this point, you can shape the dough while in the pan: punch it in there if you need to, and make sure there are no gaps between the dough and the sides of the pan. Loosely tent some plastic wrap over the top of the pan and let sit to rise (preferably in a warm part of your kitchen). 5. After 45 minutes, the dough should be risen enough to just be rounded above the rim of the baking dish. Even if the sides are not risen above the rim, you don’t want to let it rise too high. Preheat your oven to 350 degrees. 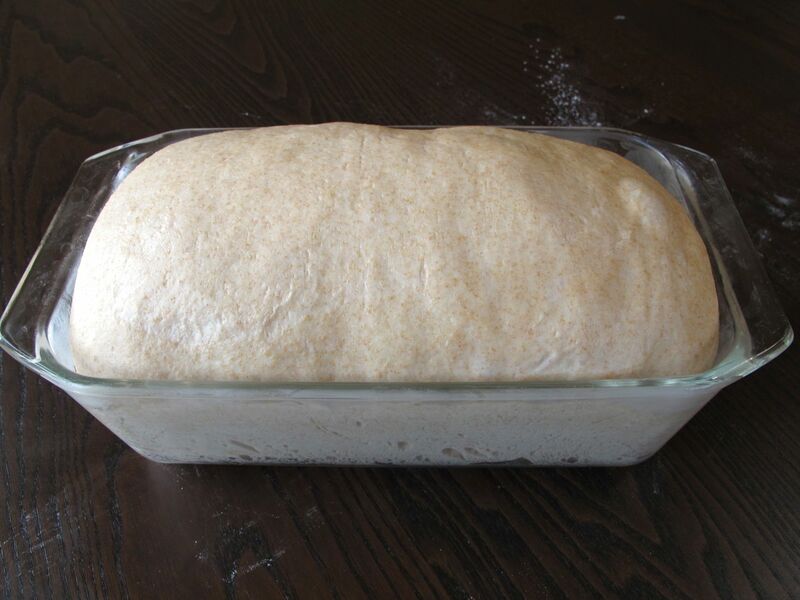 Once the dough has risen an hour, it’s ready for baking. Bake for 35 minutes. Let cool for 5 minutes before turning the loaf out of the pan onto a wire cooling rack, then let cool completely. Store in a plastic bag in the fridge. 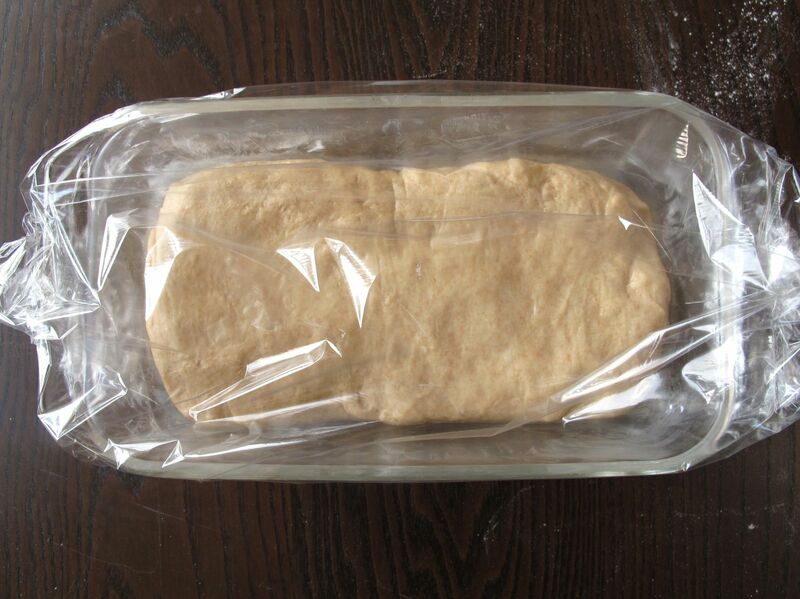 To preserve freshness, only slice off what you want when you want it, and your bread will keep for up to two weeks. (If you slice it all at once, it will become stale pretty quickly.) Enjoy with PB&J, Speculoos, butter and jam, or however way you want it; you have sandwich bread now! Mmmmm that bread looks seriously perfect. 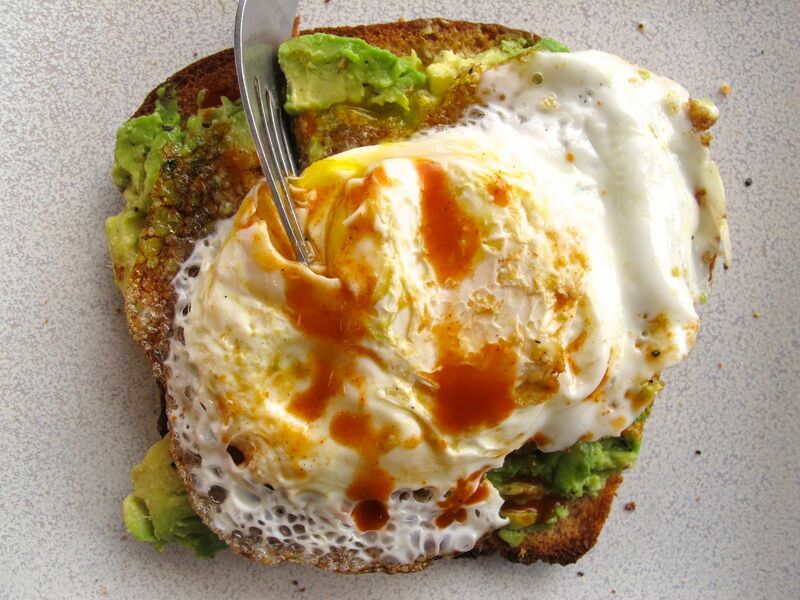 Thanks for this simple and amazing recipe! That loaf looks delicious. In your recipe, you write 1 1/2 lukewarm water. 1 1/2 what? Thank you! Whoops, sorry! That’s 1 1/2 cups lukewarm water. Thanks so much for catching it; I’ll fix it right now! i love reading about your adventures in sandwich bread making! you surely are persistent and i appreciate the effort you put into research. is this something that you do every single week? I try to make it every week, I succeed most weeks. It just makes weekly lunch planning easier. Thank you! I had a similar experience learning to bake bread. I went through about 30 or so iterations before settling on this recipe for whole wheat sourdough sandwich bread. Yeah I found that it really improves moisture retention. Starch will readily give up its water and I don’t have much sugar in the recipe to help retain it. I keep meaning to look up why egg whites help with this, but my bread previous to this would dry out after a day or two. Now the limiting factor for lifetime is mold, which is about a week unless I really sour it or freeze it. I have been using a mix of red and gold WW bread flour with great results. 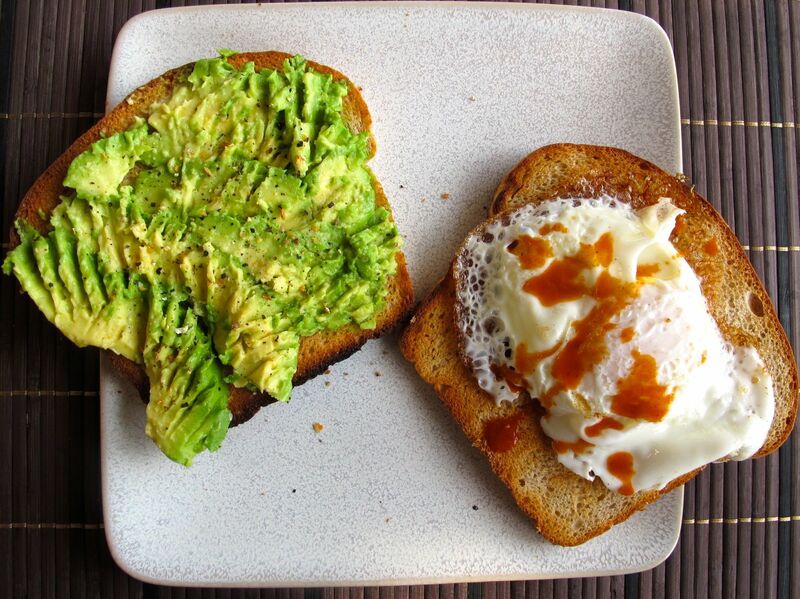 Your bread looks awesome, so do the toppings! That bread looks like a proper achievement. I would love to try it. Thanks! I’m very proud of it! Looks fantastic. Baking is always trial and error. But oh the glory when you finally get it right. Well done. Thank you! The toast is pretty glorious! wow! 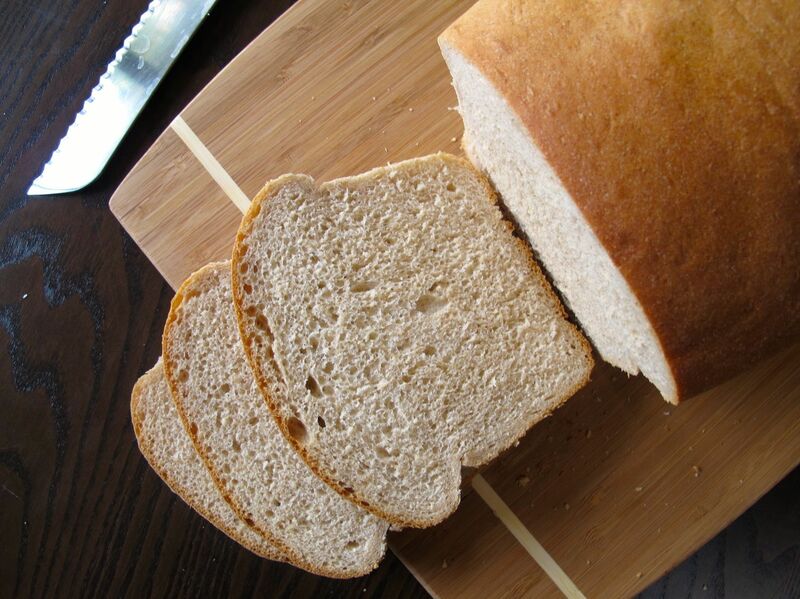 making your own sandwich bread, what a lovely idea! sounds delicious! If at first you don’t succeed… Impressive! try and try and try and try… for an age… Thank you! Thank you. The pictures are Allison’s specialty. I have the Reinhart’s whole grain book too and I haven’t had much success. Yes the breads come out fine but something in me still seeks that 50-50. I have a feeling Reinhart has skills that can’t be easily transmitted through words. But you inspired me to crack it open again. Thanks for this recipe! I love Reinhart’s recipes and I’ve had instant successes with several of them, it’s just the sandwich bread I have a problem with. He, and other people like him, must have a magically warm kitchens and a preternatural hand technique that we muggles just don’t have. 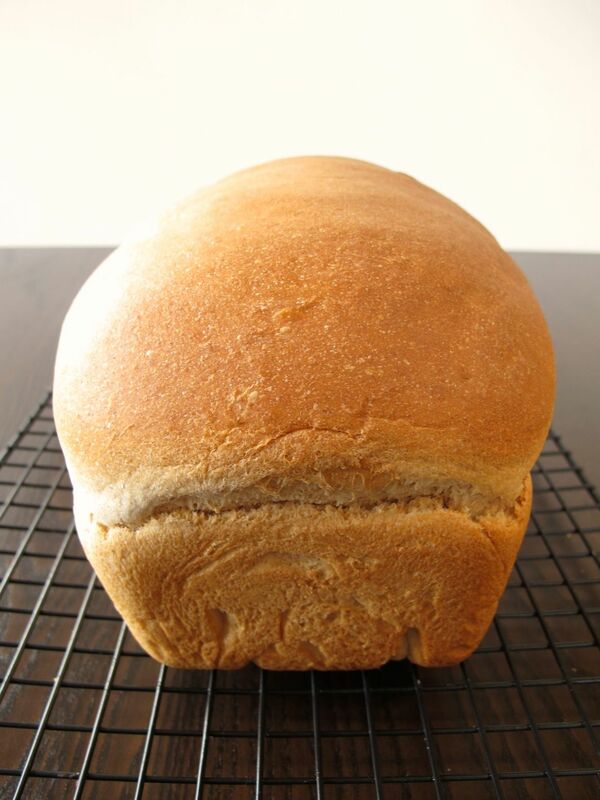 we have a zojirushi breadmaker, which makes a more typical loaf. any idea if i need to tweak the recipe for it? No tweaks really, when I had my breadmaker, I just added all the ingredients in no particular order and it did all the work for me. I would still allow the yeast and the water to become foamy together. I feel like I’ve mentioned this before, but I’m technically a boulanger. That’s what I went to baking school for. AND I HAVEN’T MADE BREAD SINCE LAST SPRING. I’m pretty sure they’re gunna take my diploma back. Yeah, some weeks go by when I haven’t made any type of bread and just like knitting when my fingers start to itch to want to repeatedly move my needles through some soft wool, my hands want to start kneading and plying dough. The repetitive movements offer a kind of solace, it’s like meditation really. Only the outcome is some awesome toast! Wow this is serious bread. Good job! You are really inspiring. I’ve always been afraid to try this, but after reading about your trials and tribulations I may just give it a shot. Those photos are stunning. I am pretty sure you will not be like me and have to try and fail 30 times before succeeding. I hope you like the bread this recipe yields. Now THIS is a recipe I’ve been desperate to find. I’ve had exactly the same problems as you’ve described here with my sandwich loaves and I’m really excited to try this. Thanks so much! SOOOOOOOOOOOOOOOO awesome! Finally got a chance to make it. The thing rose like nobody’s business! Quick question : I have a little man that is intolerant to dairy. Could I replace the butter by vegan spread or even better, oil? I’ve become a serial commentator LOL! So this bread has been such a hit, but my son is dairy intolerant so I decided to try olive oil and it worked wonderfully! Also, this time around, did 1/3 white, 1/3 wheat and 1/3 spelt with crushed dried Provencal herbs. Amazing!!!! This is officially my go-to recipe now. Next step : Cinnamon-raisin!